Today we catch up with baritone Michael Todd Simpson, who performs the role of Escamillo in Carmen (opening next week!). 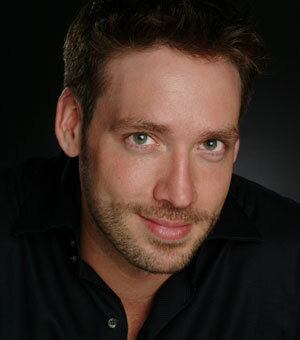 Simpson is an alum of our Young Artists Program, who made his Seattle Opera debut in 2005 as Hermann in Les contes d’Hoffmann, and followed that up in 2007 with Marcello in La bohème. Below, we ask him for his advice to our current group of Young Artists--five of whom appear in Carmen--and talk about the challenges of singing Escamillo. Act II sits lower than Acts III and IV, and people expect a sort of beefy quality to the Toreador Song, a heavier bass-baritone quality. A bass wouldn't sing it; it’s either a bass-baritone or a baritone. I’m a high baritone, so once I get through Act II, I’m home free, whereas most bass-baritones have no problem with the aria and then Acts III and IV kill them. I have the opposite problem. Anita Rachvelishvili (Carmen) and Michael Todd Simpson (Escamillo) rehearse for Seattle Opera's upcoming production of Carmen. You’ve had a lot of opportunities to work on this role in the past few years, though. Yes, this is my sixth time in three years, and my third time this year alone. I’m getting a lot of practice! This summer I did 11 performances at Glimmerglass, in a small theater in upstate New York which only seats like 800 or 900 people. So I actually felt like I could back off a little bit and not try and produce a ton of power and sound. I found that by doing that, I was able to give more, and have more fun with the role. So that’s what I’m trying to continue to do, but it’s tricky. 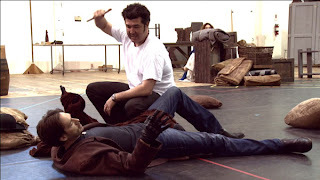 Michael Todd Simpson (Escamillo) and Luis Chapa (Don José) rehearse for Seattle Opera's upcoming production of Carmen. When people play the game of “What opera character do you most want to be,” many choose Escamillo. Was that the case for you? What is it that’s so appealing about this character? The thing that’s not appealing for me is I’m only on stage for five minutes and everyone judges me completely based on those five minutes. But I love the stature that he has, I love being able to come on stage as Escamillo—he’s a huge rock star! He’s like Bon Jovi walking out there. I just wish he was on stage more often. Since you play a bullfighter, have you studied up on your role by exploring the world of bullfighting? I’ve studied a bit. There’s tons of stuff on YouTube that I’ve watched. It’s pretty amazing to watch toreros move, and I did it mostly to watch them walk and stand. It’s very stiff, there’s not a lot of movement, and it’s very precise. There’s no movement that’s not intentional. And the Act IV torero costume which I wear into the bullfight is my most elaborate costume in the entire show. That’s the time where you really need to show you have a matador’s presence. At the same time, you don’t really see a lot of bullfighters outside of the ring, so how do they walk into a bar? When they walk into a room and they say, “Votre toast! Hey guys, cheers, I want to salute you!” I think they sort of relax a bit. 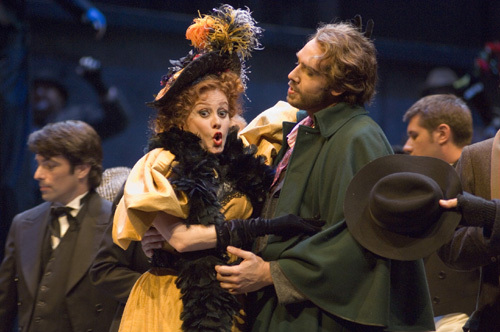 Margarita De Arellano (Musetta) and Michael Todd Simpson (Marcello) in Seattle Opera's 2007 production of La bohème. We recently wrote a blog outlining what happens at bullfights, which are very controversial events. What do you think about the topic? I don’t really know, I don’t fall on either side. Yes, it can be seen as inhumane and cruel (though people pick and choose what they think is cruel), but to the people who have had hundreds and hundreds of years of history with it, it’s an art form and a sport. The reason people make such a stink about it, though, is because you have an animal in the ring that didn’t choose to be there. We also have crazy wrestlers and fighters who beat the bejeezus out of each other, and we call that a sport and no one stands up and says, “This is inhumane!” but that’s because they chose to be there. So I guess the fine line is whether you’re giving those in the ring a choice or not. But watching bullfighters, the skill they have is amazing. Michael Todd Simpson (center, as Hermann) in Seattle Opera's 2005 production of Les contes d’Hoffmann. This production of Carmen also stars several current Young Artists. As a successful Young Artists Program alum, who’s now making a living singing all over the world, what advice do you have for these singers today? Practice. Practice, practice, practice, a lot. A lot of this business is about word-of-mouth and the only way to get that is to get your name out there, so sing for as many people as you possibly can. Crash auditions—that’s what I did. Do as many competitions as you possible can because the judges for those competitions are the people who hire other people to sing shows. Get out there and sing. Also, find a good teacher and stick with that person, because you’re not done. What I find with so many singers these days is they get out of grad school and they’re like, “OK, I’m done!” No, you need to be practicing with a teacher, consistently. The voice doesn’t stop changing until you’re in your mid-thirties, for most of us, so if your voice is still changing, you need someone with a good set of ears saying, “That doesn’t sound good” or “You need to change the way you’re doing this.” My voice in my late 20s compared to where I am now is just completely different. And I got consistent lessons along the way so someone could say, “You’re doing this well, but you’re not doing this well.” That would be my advice. Lots of lessons and coachings all through your 20s and into your 30s. In case you missed Michael Todd Simpson's appearance yesterday on "New Day Northwest", CLICK HERE.